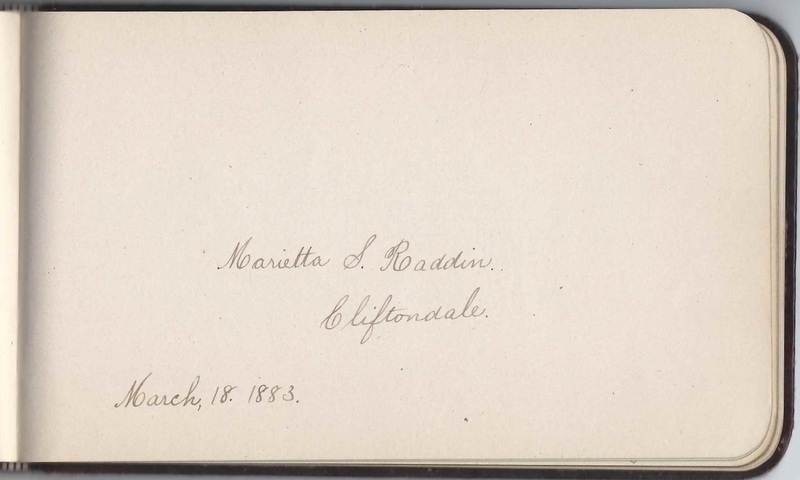 1880s autograph album of Maria S. Raddin of Cliftondale, Massachusetts, a neighborhood in the town of Saugus, Massachusetts. The album was presented to Maria by Emma J. Grant at Christmas in 1881. 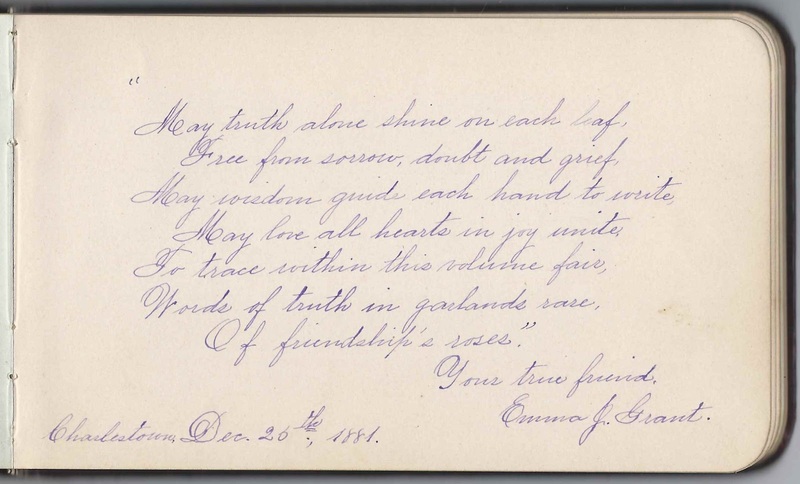 Emma also inscribed the following page at Cliftondale, Massachusetts, on December 25, 1881. 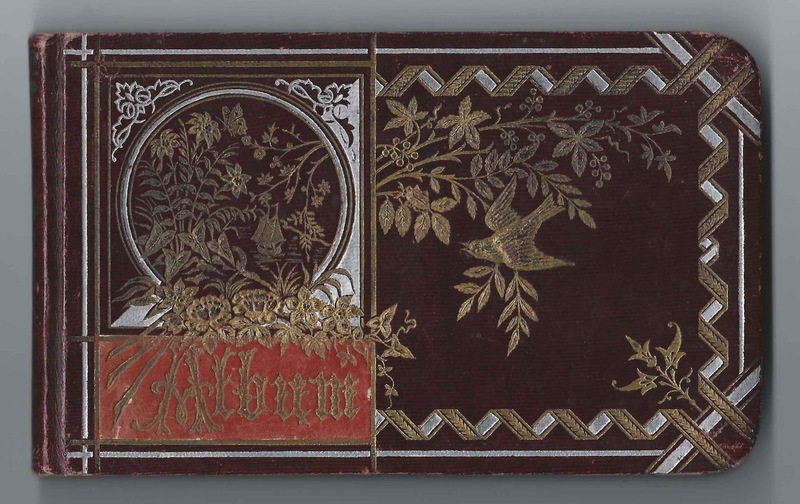 The album is approximately 7"A x 4-1/4" and contains the sentiments of 30 of Maria's relatives and friends. An alphabetical list of the signers appears at the end of this post. According to her marriage records, Maria S. Raddin was born about 1857, though I found a birth record for a Sarah M. Raddin at Saugus, Massachusetts, on 3 August 1853, with the same parents, Hiram Augustus Raddin and Sarah (Mansfield) Raddin. The earlier record may have been for a daughter who did not survive. Among the signers was Marietta S. (Macy) Raddin, wife of Maria's brother Hiram Augustus Raddin, Jr. Marietta. She signed on March 18, 1883 at Cliftondale, Massachusetts. William's first wife was Judith Ann Nichols of Searsport, Maine, where Dr. Watters had located to practice medicine. They had a child who died in infancy. They then moved to Mechanic Falls, Maine, where their son William Henry Watters was born, on 23 June 1876. Not long after, on November 4, 1876, Judith died. Son William went to live with Judith's sister at Searsport, Maine. Dr. Watters continued his practice at Mechanic Falls until 1885, when he relocated to Lynn, Massachusetts. Son William became a physician himself, after graduating from the Boston University School of Medicine and setting up practice at Lynn, Massachusetts, and Boston, Massachusetts. He married Gertrude Mary Hepburn of Canada. I don't believe Maria and Dr. Watters had any children of their own. Dr. Watters died in 1902 and is buried at Searsport, Maine. See more information on him here, from an article in an early 1900s issue of the "Register of the Lynn Historical Society". Here's a page that intrigued me; perhaps a reader can add some background. 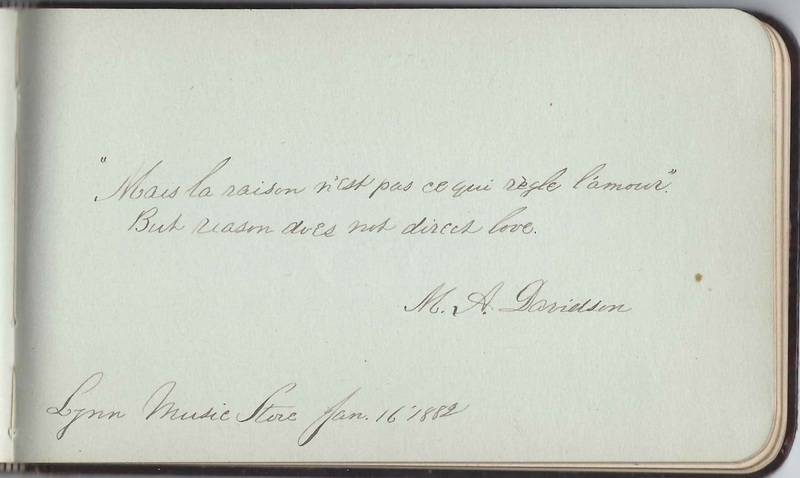 M. A. Davidson signed a page at the Lynn Music Store on January 16, 1882. A. O. W., signed on "1882-1-11"
Mary E. Abbott, signed on January 21, 1882; her husband Justin E. Abbott of Cliftondale, Massachusetts, signed the right facing page. Justin E. Abbott of Cliftondale, Massachusetts, signed on January 22, 1882; his wife Mary E. Abbott signed the left facing page. Emma J. 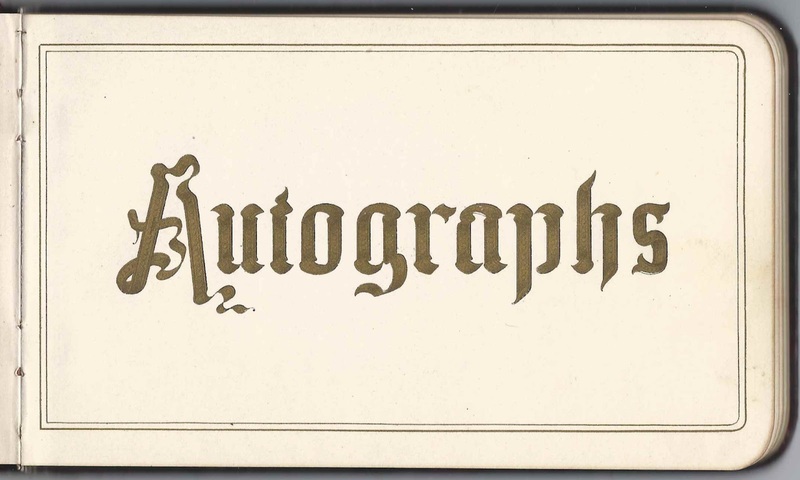 Grant, signed at Charlestown, Massachusetts, on December 25, 1881; she also signed on the presentation page. Walt Mansfield, signed on January 9, 1882. Presumably Walter D. Mansfield, who shared the page with his sister Mabel C. Mansfield and his sister-in-law carrie Louise (Wheeler) Mansfield, who was married to Justin Edward Mansfield. C. L. Mansfield, signed in January 1882. Presumably Carrie Louise (Wheeler) Mansfield, wife of Justin Edward Mansfield, and her siblings-in-law, Walter D. Mansfield and Mabel C. Mansfield. 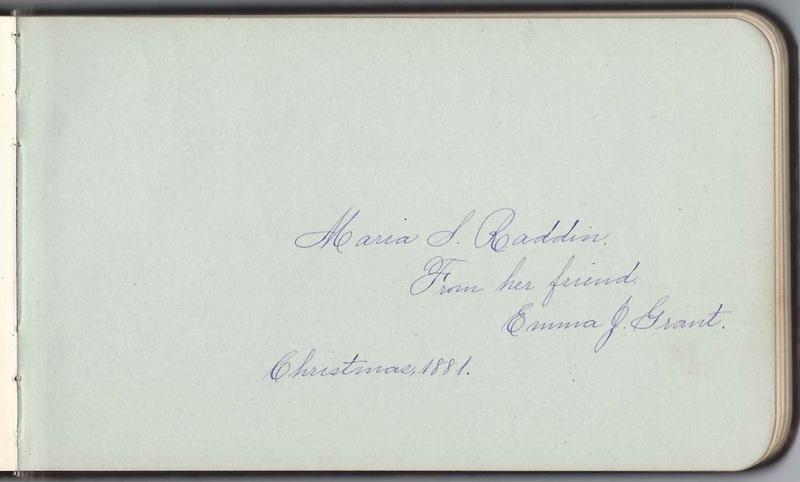 Annie W. Raddin of Cliftondale, Massachusetts, signed there on "2-9-82"
Marietta S. Raddin of Cliftondale, Massachusetts, signed on March 18, 1883. She was Maria's sister-in-law, Marietta S. (Macy) Raddin, married to Hiram Augustus Raddin, Jr.
F. Sweetser, signed at Cliftondale, Massachusetts, on January 6, 1882; middle initial might be K or H or ? Eben Tourjie, signed at Boston, Massachusetts, on April 8, 1882. Born in Rhode Island, about 1835, son of Ebenezer and Angelina (Ball) Tourjie and husband of Sarah (Lee) Tourjie.